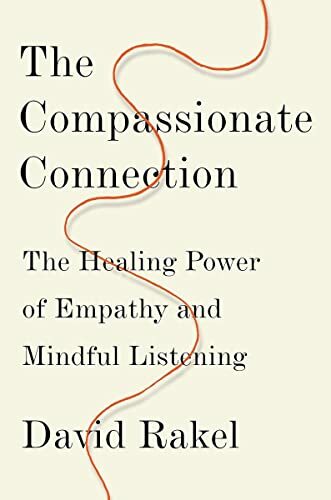 By its title, David Rakel's The Compassionate Connection: The Healing Power of Empathy and Mindful Listening might seem like another book about empathy and mindfulness. That, however, would be a premature diagnosis, one that would betray a not so careful reading of the book. This book, though, is all about giving care and connecting with others, be it with "an ailing friend or a loved one," with "a patient or client or coworker" (p. 230), or with a "manager" or a "parent" (p.150). If empathy and mindfulness are the essential conditions for connecting with others, then Rakel is writing about how this connection can be compassionate. A compassionate connection is not just a meaningful bond with an Other, but a "therapeutic dance" (p. 183), "[b]oth are transformed" (ibid.). The book is overall well-written and flows very nicely. Rakel blends the exposition of latest scientific research with personal narratives and thoughts deriving from self-reflecting moments as an MD. The book is divided into two main parts preceded by an introduction and followed by two appendices. The introduction starts boldly: "we are born with an innate and nearly limitless capacity for caring and compassion" (p. ix). Yet, we do not often realize this potential even if our brains are "wired for cooperation and giving" (ibid.). While primarily addressing professional caregivers, Rakel aims to show how everyone can "use the vital yet surprisingly low-tech tool of human connection" (p. x). This low-tech tool has what he calls "healing effect – a person's capacity for self-healing" (p. xii). Each Part of the book is made up of 5 chapters, each of which are broken down into smaller sections. In the first chapter (Compassion Hastens Healing) of Part one (Our Healing Power), Rakel starts with a self-reflection as an MD. He illustrates how caring is nowadays driven by a quick and easy approach whereby we think that there is "a pill for every ill" (p. 6). He asks a crucial question: "How can caregivers evolve beyond the dangerous 'find it, fix it' pharmaceutically dominated medical culture they live in?" (ibid.). The reply is offered in the following section whereby a claim is advanced that caregivers can become beings of "service," healers rather than helpers, through "integrative medicine" (p. 10). The latter is a holistic approach which "reaffirms the importance of the relationship between practitioner and patient," it treats the whole person, it is "informed by evidence and makes use of all appropriate therapeutic and lifestyle approaches, healthcare and disciplines to achieve optimal health and healing" (pp. 10-11). This approach has two critical implications. On the one hand, it insists that "[n]o matter the technologies or medicines available, the healing visit or therapeutic ritual itself has always been critical in an individual's care" (p. 14). The presence of a practitioner is vital, no computer can supplement it. On the other hand, it is through the practitioner who is present that such a ritual can be initiated so that a connection between practitioner and patient can end up being compassionate; and thus allowing for the self-healing mechanism of the receiver/patient to reach its greatest potential. This ritual does not simply require the bodily presence of the healer but their mindful presence. This means that the caregiver must engage in actively listening to the story of the patient in order to gain insights about their overall historical condition. Chapter two (Mind and Body Connected) elaborates on the ways one's self-healing process can be activated. The compassionate connection is an active healing process whereas "taking pills, receiving acupuncture, or getting a massage are all passive therapies" (p. 40; emphasis in original). Drug consumption is a short-term solution as the organism adapts to its efficacy. In addition, there "can be long-term harm from overuse of this quick fix" (p. 43). The compassionate connection, however, is an active healing aiming at putting "the mind's capabilities to work in healing" (p. 45). Rakel elaborates on the placebo effect studies which constitute real evidence of this process. "The Biology of Connection" is dealt with in chapter three. Here, the latest research on mirror neurons is explained. According to the latest findings in neuroscience that Rakel presents, not only the movements of the Other are mirrored in our brain, but also their emotions. Empathy and compassion are associated with our biological capacity to share positive feelings. Empathy is associated with the sharing of positive feelings while emotional contagion is associated with negative feelings. "The good news here is that sensitized mirror neurons can be cultivated and activated to communicate positive feelings" (p. 63). This happens due to the plasticity of the brain. Rakel provides an interesting synthesis of neuroscience and epigenetics to show that while we have a capacity to connect with others and thus share feelings, we can enhance this capacity. "If individuals desire to become good at serving and healing others, they must reinforce these parts of the brain" (p. 70). Chapter four (Make Health Primary) constitutes an attempt to show how we can move towards activating these parts of the brain. It is an attitude of "salutogenesis," that is, "a health promoting worldview, one that encourages people to develop the appropriate skills and resilience to navigate life's tumult" (p. 83). This requires one to have meaning and purpose. With the latter, with something to aspire to, we can develop positive expectations and thus strengthen the possibility of positive physiological effects. The caregiver who has actively listened and understood the patient can stimulate this process as well. With reference to many relevant cases from his medical experience Rakel admits: "But if I, as a physician, give my patient hope and encourage him to believe in his unlimited potential for health, his body will do all it can to heal itself" (p. 93). Yet, the good intentions of the caregiver can always go bad, so they need to be mindful about how they are to initiate and carry out this ritual of compassionate connection. "Our biological tools for connection – mirror neurons, oxytocin, brain plasticity, epigenetic influences, and hardwiring – can also, in a sense, betray caregivers and the people they serve" (p. 103). The potential of doing bad – nocebo effect – during this connection is always a possibility. Thus caregivers need to be mindful. This chapter works as an introduction for the second part of the book by describing those attitudes that need to be bracketed away while trying to establish an authentic compassionate connection. Chapter six (Identify and Free Yourself of Your Biases), as the first chapter of Part two (Make the Connection) deals with this bracketing in great length. It is essential that caregivers realize their own biases that are, more often than not, inconspicuously projected onto their patients with the risk of muting them. In such cases, the diagnosis can be detrimental. Rakel shows that empathy, as a positive connection with the other, might not be authentic but instead a projected set of beliefs and feelings onto another person. Caregivers "run the risk of projecting what they believe onto the other person before they've had the chance to gather all of the information to be of real service" (p. 138). Thus, "to be of service" (p. 140), caregivers must empty the clutter in their mind and have a beginner's mind when attempting to achieve the compassionate connection. Caregivers need to perform a mini "mindful meditation" (p. 153) for an authentic compassionate connection to occur. Compassionate connection, thus, requires preparation. And this preparation leads to mindfulness. Caregivers must learn to pause and listen, not just hear, what the patients are saying. Listening is active where judgements and prior knowledge must be suspended. Chapter seven engages precisely with this process: "Be Present, on Purpose, without Judgment" (p. 147). To be present means to "drop into the moment with complete presence" (ibid). The latter can only be achieved if the caregivers learn how to pause, "to leave their comfort zone in order to consciously enter the space of the other's needs with a clear and open mind" (p. 149). Rakel takes the time to identify acts that might jeopardize this attitude – like "reflex" (p. 151), being distracted or having a "wandering mind," and "multitasking" (pp. 160-161). Presence requires that we "Physically Communicate Good Intentions," which is the subject of chapter eight. This can happen verbally but Rakel underscores the importance of non-verbal communication. This is important not only for the patient to understand that the caregiver communicates "I'm fully open to what you have to say" (p. 168), but also for the caregiver to understand whether someone is not at ease, or lying, or not telling the whole story. It is the authentic story that the caregiver must seek (chapter nine). A compassionate connection requires authentic communication based on dialogue not monologue or duologue – where each person is speaking and hearing each other in turns without being engaged in mindful listening. Authentic communication is a circular process not a linear one (pp. 206-208). This means that pausing is required not only for emptying biases before engaging with the Other, but also during the communication in the form of silence. Pausing for silence means "I'm here, I'm listening; I care. It offers a semblance of connection" (p. 211). In the final chapter Rakel tries to show that, contrary to what is believed, a compassionate connection does not lead to burnout. Burnout comes from too much empathy, the so-called "empathic distress" (p. 224). With empathy and emotional contagion both positive and negative emotions are mirrored and thus burnout is most likely unavoidable. However, "[c]ompassion is the antidote to empathic distress" (ibid.). When it is really authentic the participants move from burnout to beauty. Compassionate connection means being interconnected (p. 224; 227); both parties benefit in this healing process. Rakel is so convinced of this that he says that whenever compassionate connection takes place "I feel that I should pay my patients instead of them paying me" (p. 235). While I would wholeheartedly recommend this book to professional caregivers, some critical points are required since it is intended for a wider audience. As mentioned in the beginning of this review, this book requires time for careful reading to avoid a quick diagnosis – just like the compassionate connection requires investment of time from the caregiver(p. 18; 113; 140; 209). But if I follow Rakel to the letter, this review is already problematic. As a diagnosis, this review would fall short without the presence of Rakel. And what about the presence of Golant, that silent feminine signature which haunts the text but is never presented in the book in her own words? Despite this double bind, I shall risk some careful thoughts in the present absence of the patient. On the one hand, I rejoice with Rakel's and Golant's attempt to show how every patient is not an object to be treated but a living person with a history. And this history must be accounted for in their treatment. Western medicine, driven by (post-)positivism, has long treated the ailing person as parts without a body, parts which operate mathematically like parts of a machine. Rakel and Golant make a wonderful attempt to bring back the importance of the living body in healthcare. If anything, this is the most crucial contribution of the book. On the other hand, Rakel and Golant present this as though it is a breakthrough finding of modern scientific research; like a "surprising discovery" (p.87). This makes me wonder about the extent to which this approach is authentically integrative. The central thesis of embodied minds and self-healing processes which Rakel and Golant espouse are not new. In this respect, the compassionate connection could have been strengthened with the work of relevant (neuro)phenomenological and psychoanalytic studies in this respect. There seems to be little empathy toward this kind of science – I could only trace a vignette of Jung (p. 121). This is important precisely because the authors proclaim to be working through the integrative paradigm of body and mind which is against Cartesian dualism, yet for them everything happens in the brain! Cartesian dualism (p. 34) is not overcome just because the material brain has supplemented the ideal mind, as if the brain is over and above the rest of the body. Pace the claims on body adaptability on drugs and the chapter on non-verbal communication, it is brains that mirror each other not embodied minds. A careful reading will reveal another double bind. I rejoice at the attempt of the authors to show that the compassionate connection can be more powerful than medication; I cannot agree more with the courage to admit that medication as passive treatment leads to "long-term harm" (p. 42). The cases they recount of cancer patients must be read by all. Yet, in one of the unnumbered pages of the book we read: "meditation techniques and practices described are not intended as a replacement for medical advice or psychotherapy. Please seek the advice of a qualified physician or therapist if you are experiencing symptoms of emotional or physical illness." Yet, to a certain extent, the way the compassionate connection is described, as a self-healing stimulation which is interpersonal, replaces the practitioner. Concomitantly, we can ask: To what extent can such a connection between caregiver-patient be purely authentic when it takes place within the western capitalist system of exchange and its logic of profit? No matter the good intentions of Rakel and Golant, I believe that these intentions will go bad in a capitalist system where healing would ultimately have its price – after all, as cynically as it sounds, a compassionate connection could have saved "$1.7 billion in malpractice costs if medical staff and patients had communicated better" (p. 189). I worry that the suggested supplementation of pills with integrative medicine is just a supplementation of one chemical pharmakon with another "low tech" pharmakon with less chemicals. The "retraining" (p. 173) that Rakel and Golant propose is not emptied or devoid of the bias of the capitalist "Western way of thinking" (ibid. ), but, perhaps, and to a certain extent, a reshuffling of the logic of capitalism which needs to re-appropriate healing in order to survive the threat of the imminent supplementation of practitioners by computers and medical machines (p. 14). Does Rakel not affirm this when he says: "From my experience, interpersonal healing mediated by the connection is not trickery but a valid and proven modality that modern science is just beginning to capitalize on"? (pp. 50-51; my emphasis). It is this capitalization that is worrying. In such a context, how can caregiver-receiver be "two people vested in the outcome" (p. 140) unconditionally when the receivers are always "clients" and "health consumers" (p. 208)? To use Rakel's and Golant's words, by capitalizing on the compassionate connection or by connecting compassion to capitalism will always risk making the "I'm here, I'm listening; I care" (p. 211) indeed "a semblance of connection" (ibid; my emphasis) rather than an authentic one. My final worry is about the relation between healing through compassionate connection and death. If the compassionate connection is to take place, then it can only happen when it is authentically grounded on human reality. And this cannot be with an appeal to an unlimited life, but a meaningful one which faces death. Rakel and Golant struggle with death in the entire book. Interestingly, confronting death is largely avoided in the book. This is to be expected since, in the professionalization of health, caregiving must be done in such a way that clients or consumers of health forget about this ultimate potentiality of human reality. The product of health must be sustained and its quality insured for equity and loyalty. But, paradoxically, if the "embodied compassionate presence in the moment" (p. 146) is to take place, death must be dealt with mindfully. Rakel and Golant show this brilliantly in the narrative of a dying cancer patient with their oncologist (ibid.). Could it be a coincidence that this compassionate connection witnessed by Rakel, and which he "will remember for the rest of [his] life" (p. 145) came from a woman oncologist being honest about death and for whom Rakel admits: "I have no idea whether the oncologist practiced meditation" (ibid. )?